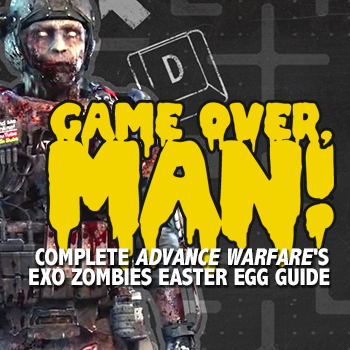 Escape the first EXO Zombies map in Call of Duty: Advanced Warfare with our Easter egg guide, explaining every step to complete Outbreak. Ever since Black Ops, Treyarch has traditionally included extensive Easter eggs in its Zombie survivor mode. That level of bizarre, punishing challenge continues with developer Sledgehamer in the Advanced Warfare Havoc DLC. The Outbreak map for Exo Zombies introduces four celebrity survivors, including a crazy cameo from John Malkovitch, and pits them against an endless horde of the undead. Surviving isn't easy, but escape is even harder. 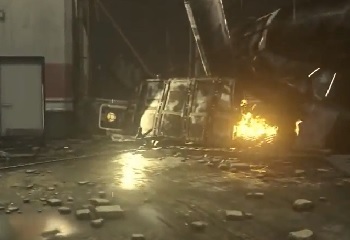 Havoc's Exo Zombies Easter egg might not have the completely surreal and obtuse design of previous sequences in the series, but these challenges are still almost impossible to figure out alone. See what it takes to escape the Atlas facility in the guide below. Work-In-Progress: CoD Easter eggs are tricky to solve. Check back later for new updates. 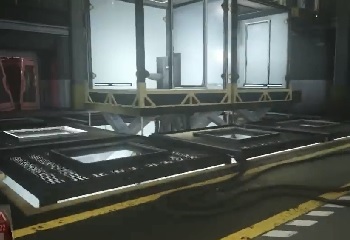 Grab the hidden Black Box in the courtyard spawn room to start the Easter egg. There's a helicopter crashed into the gate -- look to the left, between the smashed gate and the wreckage. There's a small device here. Grab it and it'll appear on the HUD near your character portrait. Spend some time earning points by killing zombies now, those points are required to open up doors later on. Open the Main Hub doors then crack open the Morgue from there. Go down the hallway and look for white computer terminals placed together on the east side of the room. Interact to insert the Black Box. The announcer states the player needs four key cards to decrypt the data on the Black Box. The next four steps can be completed in any order and some steps change depending on how many players are online. The first keycard is the easiest. To get Lilith's keycard, go to any of the 3D Printer Mystery Boxes and get the EM1. Once you've got it, give the 3D Printer another spin -- while it's spinning, shoot it with the EM1 weapon to get Lilith's keycard. Take it before it disappears. 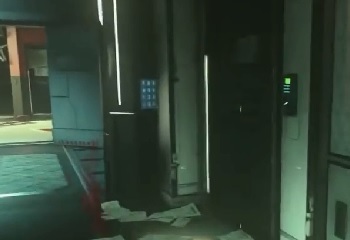 During an Infected Round, it's possible to collect Kahn's keycard. Get infected, then enter the Administration area. There are four door keypads you'll need to interact with while under the effects of the infected condition. 1. On the security checkpoint door across from the EXO Medic terminal. 2. At the end of the red hallway around the right corner inside Administration. 3. Around the divider wall from the second keypad, on a second floor balcony. 4. Across from the entrance door next to the decontamination shower. While infected, the red keypads will turn green after interacting. Use all four red keypads so they display green in the Administration area. The security office window will lower once all four pads are lit up. Look for the checkpoint across from the EXO Medic terminal. Return and grab Kahn's key card. Be quick and grab the card before the window lowers. If you're with multiple players, everyone needs to push at least one of the keypads while infected. Purchase EXO Slam, then travel to the raised white containment cells in the Holding area. Crouch and look underneath the raised cell that's last in the line. It's surrounded by lowered cells, with only one other raised cell adjacent to it. In the complicated under-works beneath the cell, look for a lever or piston. Shoot the lever until it stops moving and is completely out of sight. EXO Slam the same cell, which causes it to lower while raising up another containment cell. Look in the cell that's raised up to find an opening. Grab the card in the cell's door. If playing with multiple players, every additional player needs to EXO Slam the same cell at the same time. Go to a Trash Chute and activate it. Back away before falling in, then quickly activate it again while smoke is spewing out. You'll fall inside and land in an incinerator room. A wall closes in; to find the card, quickly shoot the ashes. Randomly, the card will appear when shooting the ashes piled up on the ground. It might take several tries, just return with a Light Machine Gun or Assault Rifle and continue shooting until the card appears. A large wall closes in while inside the incinerator, forcing you to leave and try again. Once all four keycards are collected, additional cards will drop from enemies. Kill zombies, special infected or dogs and collect the keycards that spawn off the corpses. Keep killing the undead and grabbing dropped cards until you have Access Level 49. 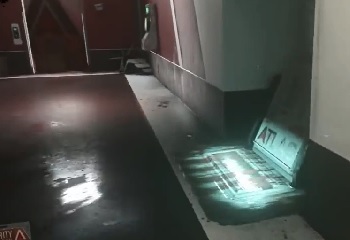 Return to the Black Box computer and interact to get the next step of the Easter egg. Around the map, there are four hand-print security scanners. Each one reads "Restricted Access" -- if you're playing with friends, each individual character needs to match their specific keycard reader. The keycard readers are always near the keycard drop location. If you're solo, you only need to find your single character's keycard reader and activate it. Using the reader gives you Security Access 50. Return to the computer, use it, and get the last instruction from the announcer. 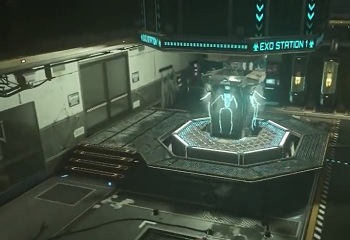 Return to the EXO Station room where the survivors first collected their EXO suits. Interact with one of the stations, then you'll hear something interesting. Ride of the Valkyries plays from an unseen helicopter. This particular piece of music can be unlocked in a completely separate musical Easter egg, too. If you're crazy enough to find all three hidden interactive objects. When online with multiple players, everyone will need to interact with a separate EXO suit station. This part can get finicky; interact [F/X/Square] until the music starts playing. That's your signal that the sequence is complete. Return to the starting courtyard to watch as the chopper prepares for a rescue landing. This is it, the final step in the Easter egg. Watch the skies to see the final event. Unfortunately, things don't work out as planned. Once the sequence finishes you'll finally unlock the achievement / trophy.